Market Creek Plaza is a commercial and cultural center in San Diego and the first project of its kind in the United States to be designed, built and eventually to be owned by neighborhood residents. Its retail outlets include the first major grocery store in the area in over 30 years—Food 4 Less—the community's first sit-down restaurants (which are family-owned), a bank, and more conventional firms like Starbucks and Papa John's. The ten acres of property house a 500-seat open-air amphitheater, a restored creek and public art, including totems, paintings and mosaics. The low-income area in which the center is situated—the Diamond Neighborhoods—is home to a very diverse population of African-Americans, Latinos, African immigrants, Asian immigrant communities from Laos and the Philippines, as well as families from Polynesia. Market Creek Plaza was explicitly envisioned as an asset-building development strategy in the 1990s. Groundbreaking began in 1999 and the complex was completed in 2004. The $23.6 million project was spearheaded by a small family foundation, the Jacobs Center for Neighborhood Innovation. Established in 1995, JCNI focuses exclusively on working in the Diamond Neighborhoods. JCNI connected with residents prior to conceptualizing the project by knocking on doors in the four communities surrounding the Langley property, which JCNI had purchased. The outreach teams conducted over 600 surveys in four languages coupled with cultural events to share food, dances and other traditions. This process led to insights around the need to address the area's food desert with a supermarket. Over 2,000 residents were involved in the planning and design process. The $10 million construction of the center was centered around minority- or women-owned contracts—at $7.9 million, they comprised almost 80% of the budget. Within the temporary construction jobs, emerging contractors received training through the Mentor-Protégé program to improve their business skills to gain better access to contracts in open competition. JCNI provided these community-based contractors with loan guarantees for “working lines” of credit for to help them expand and upgrade their businesses. As these contractors paid off their credit lines, they became eligible for bonding. JCNI also focused on capacity building and strengthening social and human capital: JCNI facilitates workshops, built up with outside expertise in curriculum development, on financial planning, asset building and preservation, with special outreach for women, youth and non-English speakers. JCNI's IPO began in 2001 and took five years to involve 419 local investors in $500,000, which reflects 20% of the total capitalization. The majority of the community investors are female, educated, African-American, and homeowners. 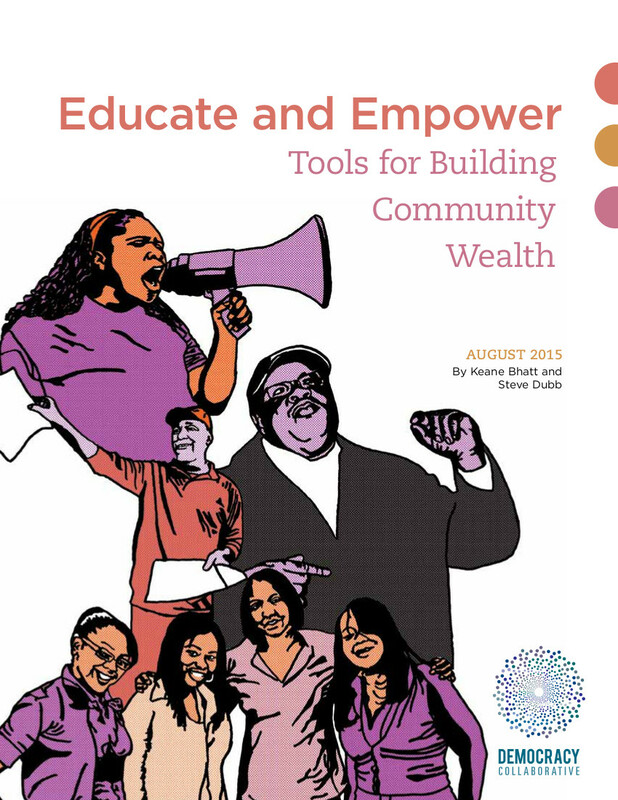 Learn more about Market Creek Plaza and other innovative community wealth building initiatives in our report Educate and Empower: Tools for Building Community Wealth. Engaged listening creates genuine community buy-in: JCNI's emphasis on "asking residents what they want before you know what you want" is distinct from requesting input on a preconceived plan. Jennifer Vanica, CEO at the time, recalls, "We contended that predetermining outcomes and activities from here to there cuts off the creativity of people to step into a new future." JCNI's participatory method led to insights that would have otherwise not been apparent but generated higher up-front costs in the development process. Nevertheless, this approach was efficient, broadly speaking, as it avoided community burdens, displacement, and generated neighborhood advocacy and buy-in around the initiative, thereby speeding up the zoning and permitting processes. Definable mission and duration can better ground the project's objective: JCNI has a unique "sunset clause" of 30 years before it "puts itself out of business." This clause "is both urgent and patient," says Vanica. A foundation committed to spending down after one generation—30 years—is forced "to think about its lifespan and figure out what it would take to support a community fully." This sharpens the essential questions of mission. Current CEO Reginald Jones says, "A viable plan considers where ownership is at sunset in 2030. So when we sunset how does our real estate development plan accomplish this broad ownership notion?" Innovation may not lead to replicable solutions: MCP's innovative community IPO channeled enormous resources and hampered community engagement because of rigid state laws. The laws stifled open discussions due to a mandatory silent period before the community IPO, and required large amounts of legal expertise and financial resources to navigate. "As sound as the model with the IPO can be," says Reginald, "it's a hard model to replicate. You can take tenets from it, but it was very expensive. Knowing now what we know, we have the Cadillac version, and we could have done it differently." Concrete steps at gender equity eliminates barriers to participation: The creation of community teams to assist in the strategy and design of Market Creek benefited from on-site childcare. JCNI worked around times of the day that mothers used to pick up kids, built an indoor play area with big glass windows, and provided food for children to facilitate mothers' participation. Participatory convening can lead to spillovers for community vitality: The social cohesion that resulted in JCNI's efforts at door-knocking and convening led to victories around basic service provisions; the residents organized to fix potholes, install streetlights and ban gun advertisements by regular face-to-face interactions that were institutionalized through JCNI's engagement.